It’s possible that you forgot your password to unlock your iPad if you change the password often. What’s worse, your iPad will be disabled if you try the wrong password for several times. In general, the way to unlock iPad passcode is using iTunes to restore iPad. But what if you really need to unlock iPad without restore as you don’t want to lose any data? Is It Possible to Unlock iPad Password without Restoring? Unfortunately, there is no official method for unlocking iPad passcode without restoring. Restoring iPhone is the only way to get into a locked iPad. 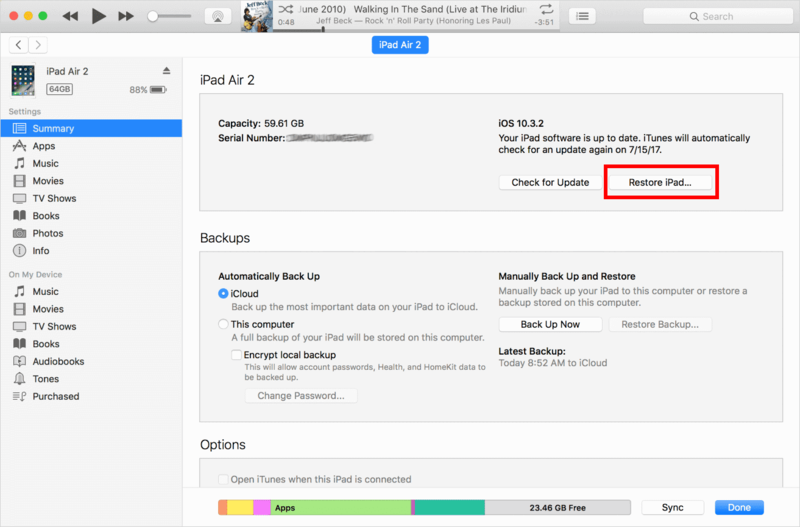 However, you can back up your iPad data before you restore the locked iPad. It will prevent you from losing any iPad data. Note: You should use the iTunes which your iPad synced with before. Or you can’t backup your locked iPad without password. Launch iTunes on computer and connect your iPad with a lightning cable. After iTunes has detected your iPad, click on the device icon at the top left corner. 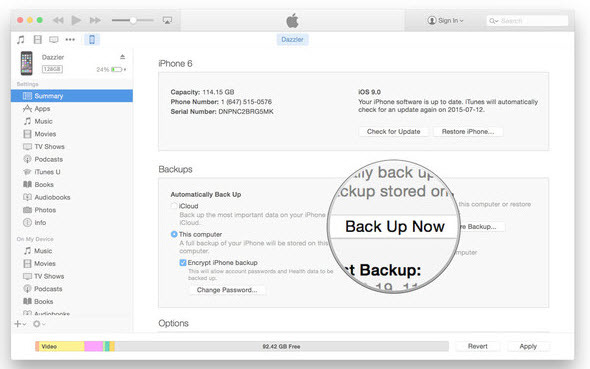 Click “Back Up Now” in the right panel. Of course, this method won’t fix the problem that you’re having but rather it will preserve your personal data. 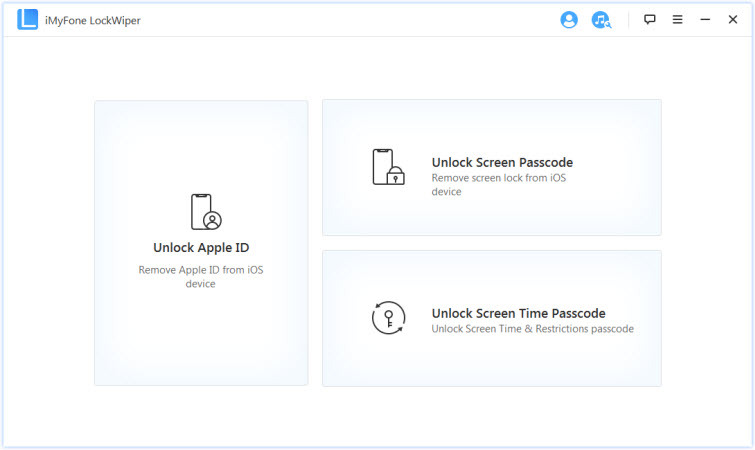 Method 1 helps you not only to unlock iPad passcode but also to unlock iPad from iCloud lock, while other 3 methods only unlock iPad screen lock. If you forgot the passcode to your iPad, iPhone or iPod touch, you may want to know how to deal with it. 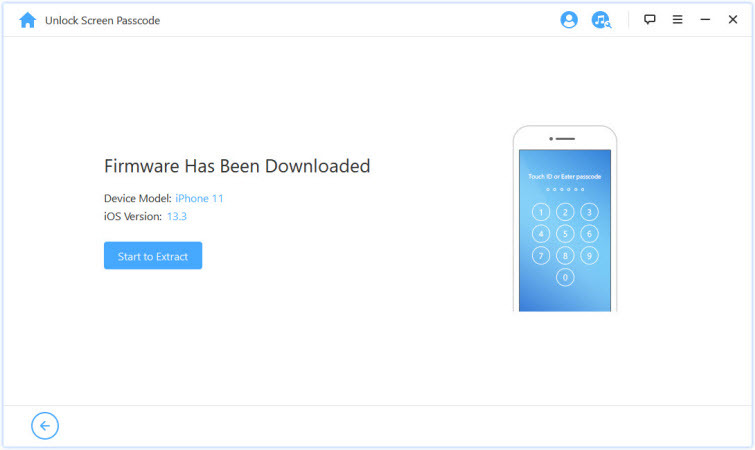 We are happy to inform you that unlock without passcode is achievable with an iOS device unlocking tool called iMyFone LockWiper. 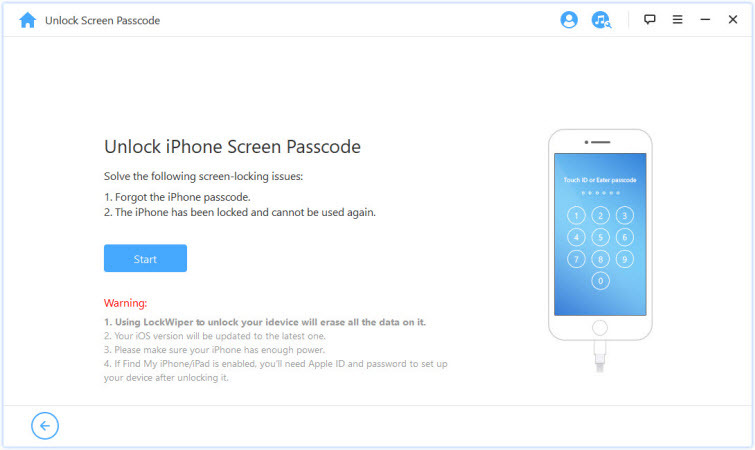 iMyFone LockWiper is the first tool of its kind that can unlock iPad passcode. What's more, it's also able to unlock iPad from iCloud lock without password. Therefore, whenever you're locked out of iPad screen, or iPad is locked with an iCloud account, consider LockWiper for help. You must find it useful and efficient. Unlock iPad Passcode: iPad is locked or disabled? iPad screen is broken and you're locked out? Use LockWiper to instantly remove the screen passcode which includes 4/6-digit passcode, Face ID or Touch ID. Unlock iPad from iCloud: Only in a few minutes, LockWiper can remove iCloud account and Apple ID from iPad without password. Your iPad won't be linked or tracked by the previous account. You can enter a new account and enjoy all features. 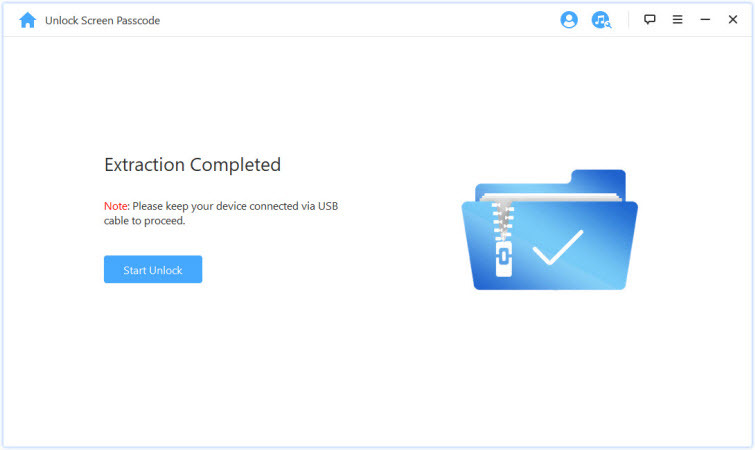 Step 1: Download and install iMyFone LockWiper. Launch it. On the main interface, click “Unlock Screen Passcode”. Note: If you want to unlock iPad from iCloud account, choose "Unlock Apple ID" instead. Step 2: Connect your iPad to your computer using a USB cable. Click "Start" and then "Next" to proceed. 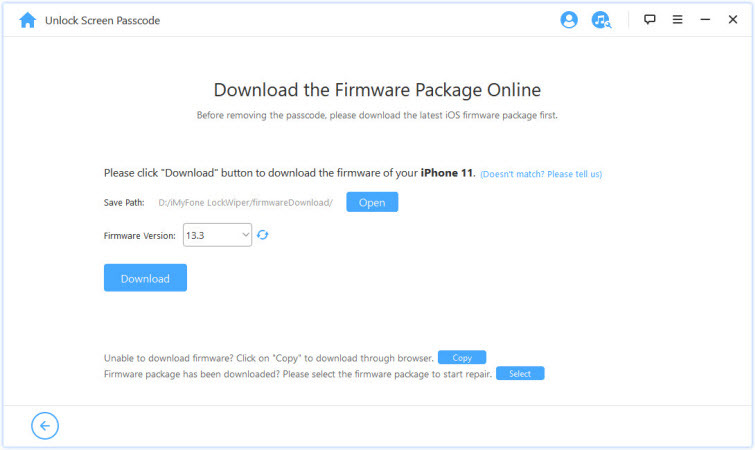 Step 3: Click "Download" to get a firmware package for your iPad. Step 4: Click "Start to Extract" when it's done. Step 5: After that, click the “Start Unlock”. Enter "000000" into the box and click "Unlock" to double confirm and start unlocking. If your iPad synced to your iTunes before, then you can use this method. Or, you need to restore your iPad in recovery mode. Launch iTunes (which your iPad synced with before) and connect your iPad using a USB cable. After it has been detected, click on the device icon on iTunes and you will be in “Summary” window. Click on “Restore iPad” in the right panel and follow the steps shown on-screen. Then just wait for it to finish. Note: The iTunes you used should be the one you used to sync iPad before. Besides, if your iPad is running in iOS 11.4 or later, the "USB Accessories" in "Settings > Touch ID & Passcode" should be enabled. This setting is disabled by default. Another option that you can consider is using iCloud to remove and unlock your iPad passcode. This way is available only when “Find My iPad” is enabled on your locked iPad. Go to the iCloud page on computer and sign into your Apple account. From the iCloud menu, click on “Find iPhone”. Once the “Find My iPhone” web app has loaded, click on “All Devices” and select your iPad from the list of connected devices. 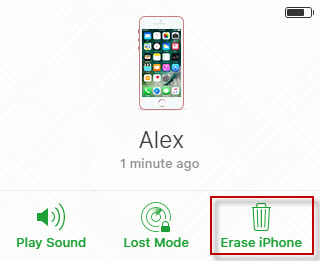 From the menu at the top-right, click on “Erase iPhone”. Type your iCloud passcode and the device will be remotely erased and afterwards. Note: This way will take effect when your iPad has connection to internet. If you never synced your iPad with iTunes, or if “Find My iPad” is off, then try this way. 1. Connect your iPad to computer to open iTunes. For iPhone X or iPhone 8 (8 Plus), press and quickly release the Volume Up button. Then press and quickly release the Volume Down button. Then hold the Side button until you see the recovery-mode screen. For iPhone 7 (7 Plus), hold the Side and Volume Down buttons together until you see the recovery-mode screen. For iPhone 6s and earlier, iPad or iPod touch, hold the Home and Sleep/Wake button together until you see the recovery-mode screen. 3. On computer, you will see a window pop up, choose Restore on it. 4. iTunes will download the latest iOS to your iPad. If it takes more than 15 minutes, your iPad will exist recovery mode. Then you need to repeat steps 2 and 3.